Kathryn Finney has started a revolution for affordable women's fashion. The shopping expert is the founder of The Budget Fashionista. The unique Web site is devoted to helping women look fabulous on a budget and is chock-full of coupons, special offers, sample sales, shopping guides and tips of the trade to ensure that women get the most bang for their hard-earned bucks. Finney is also the author of How to Be a Budget Fashionista: The Ultimate Guide to Looking Fabulous for Less. LoveToKnow chats with this busy fashion maven to glean some of her expert insight on how to shop like a pro. LoveToKnow (LTK): Right now, it's more important than ever to shop wisely. For shopaholics out there, what would you recommend as the first line of defense against whipping out the old credit card without a second thought? Kathryn Finney (KF): My tips for keeping your spending under wraps are pretty simple. Know what comes in and know what goes out. Actually sit down with your bank and credit card statements and look at your income and what you're spending. When I first started doing this, I found out I spent about $125 a month on Pom pomegranate juice. Did I seriously need to spend that much on juice? So I cut it out and put the money into my IRA. LTK: There are lots of fun, cheap items to be found out there, but what do you think is the definition of a true fashion bargain? What should we be looking for in affordable women's fashions? KF: A true bargain is an item on sale that you would be willing to pay full price for. So if you would normally pay $100 for a pair of 7 For All Mankind jeans and find them at your local Filene's Basement for $24.99, then that is a bargain. If you would normally pay $200 for a nice wool coat and find one at your local Wal-Mart for $34.99, then that is a bargain. Look for things that are durable, of high quality and that will last. LTK: Is it a misconception that quality and cost always go hand in hand? Are there any particular items you'd recommend spending more on? KF: You can find quality pieces on a budget. You never really have to pay full price. However, you may want to spend money on things that make you money, meaning a nice interview suit or briefcase. You also want to spend money on things that have a resale value or you can hand down to loved ones, like watches or other jewelry. LTK: What is the most important thing you have learned since you started your blog? KF: I've learned that quality is just as important as quantity. I actually do not have a ton of stuff in my closet, but I wear everything in my closet - everything. When something is worn out, that is when I buy something new. 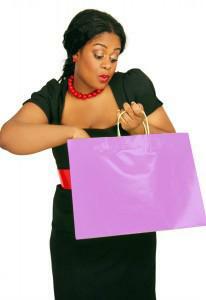 LTK: What are your favorite brick-and-mortar and online stores to find the best bargains? KF: It's hard to pick a favorite store, but I like Nordstrom Rack and DSW for shoes; Marshalls, Target and Macy's for home goods; and Endless.com for online shoes at a discount (with free shipping and free returns). Kathryn Finney says her website "started from a love of fashion, but a lack of cash. I was living well above my means, racking up over six figures in credit card and student loan debt. I started the blog in 2003 as a way to stay connected with friends and to chronicle my experiences getting out of debt." The popular website is now a favorite among women who want to look fabulous without blowing their budgets, and has had a major impact on the way women approach shopping and spend their money. For more about Kathryn Finney or to get more budget style tips, visit her website for steals and deals, advice, and shopping guides.